A line from the 1995 movie 'Heat' came to mind when a TV camera focused on Joe Schmidt near the end of last Saturday's game in Cardiff. Usually we see Schmidt staring intently at what's happening on the pitch and giving instructions into a small radio mic in his hand. But in the 78th minute of Ireland's game with Wales Schmidt held a stance we'd rarely seen before - he was standing against the exit door of the coaches' box with a thousand-yard stare, his arms folded with no instructions being delivered. "A guy told me one time, don't let yourself get attached to anything you're not willing to walk out on in 30 seconds flat if you feel the heat around the corner," Robert De Niro's character told Al Pacino's in 'Heat'. Of course, this ain't Hollywood. Schmidt is attached to Ireland's World Cup before he finishes up in his job. But how will he respond to the heat that's coming around the corner? If Ireland looked like they turned a corner against France, the players looked like they hit the wall against Wales. Hitting the wall in a marathon can have the effect of making a runner lose sight of just why they are running the race. Four minutes into the second half at the Principality Stadium, Alun Wyn Jones illegally held on to Peter O'Mahony to prevent him from rejoining the play. A few seconds later Ireland were awarded a scrum. O'Mahony neither reacted to Jones annoyingly holding onto him nor to his team-mates winning a scrum. The Munster captain, who played every minute of this Six Nations, looked out on his feet. In the week leading up to Ireland's Grand Slam game with England in March last year, Sean Cronin was asked if Schmidt was the best coach in the world. "Sure, I'm going to have to say he's the best coach in the world," Cronin smiled. More to the point, he franked what we already knew about Schmidt's approach. "When you do make a mistake in a game you're kind of thinking during the game about the review on Monday morning. "It's not many coaches that can put that kind of motivational fear into you," Cronin added. There was a distinct lack of this "motivational fear" among the players in Cardiff such was the catalogue of mistakes and the drop in discipline (a few questionable decisions by the ref, sure, but eight penalties conceded in the first half was alarming). So does the "motivational fear" approach have a shelf-life? In the search for answers to figure out what's going on with Ireland, the announcement last November of Schmidt's departure after the World Cup has been put forward. The fact the World Cup is coming up in September would seem to lessen the strength of this argument because it is a common goal for coaches and players. Others believe that because Wales are in a similar situation, with this being Warren Gatland's last season, that this argument can't hold for Ireland. Really? 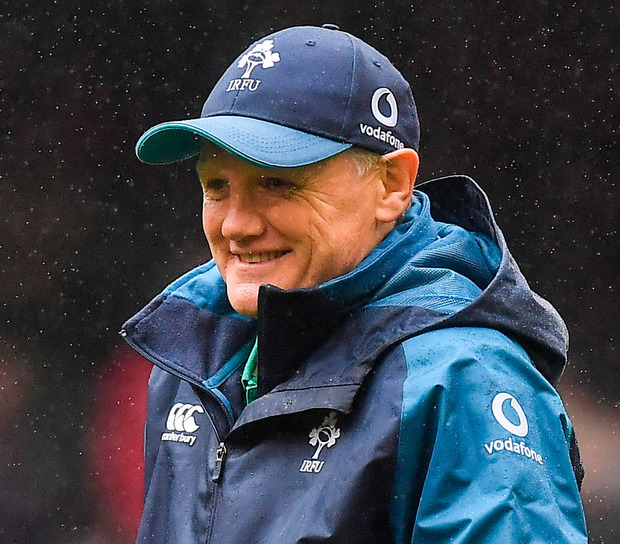 The fact that Warren and Wales are winning doesn't mean Schmidt's departure can't be a factor in the malaise with Ireland - every individual and group reacts differently. When I asked Johnny Sexton last month if the announcement has destabilised the squad, he denied it (what else is he going to say?) but he added that "it's not a distraction, really". He wasn't overly-convincing. It might not be the reason but problems generally come multi-layered. If we're questioning the effect Schmidt's departure is having on the players, what about the effect Schmidt's leaving is having on Schmidt. When I asked him if he would miss the place after his final home Six Nations game against France two weeks ago, he, surprisingly, got a little emotional. There have also been questions about whether Schmidt is in need of a break considering he went straight from Clermont Auvergne to Leinster to Ireland. He's never finished a job without winning a trophy in the final year either - Clermont won the Bouclier de Brennus in 2010, he won the European Challenge Cup and PRO12 with Leinster in 2013. It's hard to separate Schmidt's departure and this build towards the World Cup because they're tied in as one but there has been some questionable decision-making in this Six Nations. Starting Robbie Henshaw at full-back in Ireland's first game against England only ever looked high-risk. Cutting Cronin from the extended squad after the Italy game was pointed. Schmidt then complained he didn't like the use of the word 'axed' in the media reporting of Cronin's omission, which was a bit like trying to unspill the milk. And then there was the roof distraction last week. I'm told Wales got an email from the IRFU at 2.15pm last Thursday to request the roof be open and even though his press conference started at 2.20pm, Schmidt decided not to relay this and instead went back over how Wales had watered the pitch two years previously when the roof was closed. Defeat always adds a different texture to hindsight. I've never known a squad that strives for perfection as much as a Schmidt squad. "I think we're a bit obsessed about having the perfect game," Keith Earls said before the defeat to England last month. "Trying to have the perfect game is impossible but we work hard on every aspect". This approach has obviously worked for Ireland. But there is also a view that perfection - in any walk of life - can be a negative because it stifles creativity and creates a fear of making mistakes. If perfection is the aim, how does that help a team that needs to dig itself out of a hole? Does this approach, like "motivational fear", have a shelf-life? When the players come back into camp this summer for the World Cup, do messages need to be framed differently or tinkered with because what worked so brilliantly for Ireland in the past clearly did not work in this Six Nations. After the defeat last weekend, Schmidt asked supporters "not to lose faith". The last time he urged this was after Ireland's 21-10 defeat to England in round three of the 2016 Six Nations when Ireland had yet to register a win in that championship. Schmidt was right, less than four months later Ireland had their first Test win in South Africa and the year would end with a memorable day in Chicago. But this is different. This is a World Cup Ireland are building towards. A major problem in this Six Nations is that Schmidt underestimated how much the opposition would figure out his team. Who knows how Schmidt will respond to this setback. Will he tweak his approach? Evolve his game-plan? How will he regroup these players? There is no guarantee there will be a redemptive arc to the end-game of the Ireland career of the greatest coach who's ever worked here. What we do know is this: how Schmidt reacts will make for one of the most fascinating periods in Irish rugby. Independent.ie Newsdesk Alun Wyn Jones has been named 2019 Guinness Six Nations player of the Championship after leading Wales to the third Grand Slam of the Warren Gatland era.